RALLY! StopAdani – Climate Action Now! Parliament restarts on Tuesday, 12 February 2019! When they switch on their office lights and fire up their computers, 78% of the electricity that they use will have come from sun, wind and hydro, because of the ACT’s climate policies. See – it can be done, but so many of them are coal-fondling climate crisis deniers. 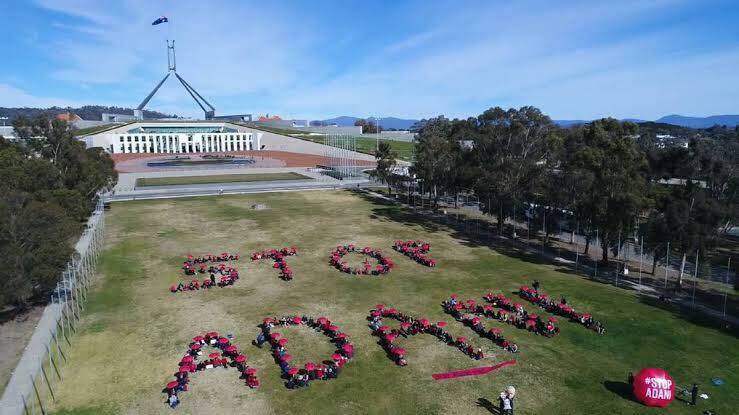 So let’s protest the first sitting day of parliament to let everyone know that 2019 is the year we stop the Adani Carmichael coal mine and take serious action on climate! No matter who is in government, this mine cannot go ahead. The majority of the population opposes opening up the Galilee Basin to coal mining. We need to make this clear to all the politicians in parliament! Let’s make 2019 the year when Australia decides to act on climate! ← Why Isn’t Climate Change Acknowledged by Everyone ?